New Drug Paths to U.S. Determined to keep control of their lucrative, illegal business, Colombia’s drug cartels are finding new partners to move their cocaine and heroin into the United States and Europe. Imprisoning the country’s top drug lords and deporting their traditional European contacts weakened the cartels for a time, but now law enforcement officials fear that they are rebuilding their illicit empires with reliable new routes. The cartels are capitalizing on the legendary smuggling prowess of Arubans, Puerto Rico’s status as a U.S. territory and the Dominican Republic’s strong New York City ties. Guatemala, once merely a stop on the drug route into Mexico and the United States, has become a jumping-off point for Europe as well. And the Russian mafia is now helping deliver the drugs to the European market, according to Colombian and Caribbean law enforcement sources. The alliances emerged in an attempt to make an end run around Mexico’s drug distributors, who had taken advantage of the Colombian cartels’ vulnerability to grasp a tremendous share of the market. The growing importance of heroin in the mix of Colombia’s illegal drug exports has permitted another distribution shift that circumvents the Mexicans. Heroin is worth nine times more by weight than cocaine, making small quantities of heroin highly profitable. So drug traffickers no longer need to hide large shipments of cocaine in freighters that dock at Mexico’s Pacific ports. Instead, they can rely on “mules” to take heroin directly to the United States in their luggage or their stomachs. These couriers transport about 90% of the Colombian heroin that enters the U.S., according to the intelligence source. Mexico became a necessary stopover point for Colombian drugs headed to the U.S. about three years ago, when tighter controls made transshipment through the Bahamas, Jamaica and other traditional Caribbean routes highly risky. By the time Miguel and Gilberto Rodriguez Orejuela, the self-confessed heads of the monolithic Cali cartel, were arrested in 1995, the Colombians were hooked on Mexican help. But as the big Colombian cartels fragmented, the infrastructure they used to get drugs across the U.S. border crumbled. Emerging traffickers on the South American country’s Atlantic coast to the north and in Valle del Cauca province, of which Cali is the capital, in the southwest developed different contacts to export their narcotics. Distribution in Europe posed a different problem. The Colombians traditionally worked with the Italian Mafia, especially to launder money in Europe, according to intelligence sources. But that alliance has weakened over the last two years as nine Italian capos have been extradited from Colombia. Further, the fragmenting of the Colombian cartels has made the business less attractive to the Italians, sources say, because now they must deal with several small players rather than a single, dominant drug lord. While the ties between the Italians and Colombians have not broken, they have definitely frayed. As the Mexican traffickers extended their tentacles deeper into the narcotics business, their services became pricier. They doubled their smuggling fee to 40% to 50% of a cocaine shipment, said Special Agent Bill Mitchell, who heads the U.S. Drug Enforcement Administration’s Miami field office. In response, Colombian traffickers began testing alternative routes in the Caribbean. In recent months, they have struck long-term alliances with Dominicans, who charge a 20% smuggling fee, according to Felix Jimenez, a DEA special agent in San Juan, Puerto Rico. The Dominicans provide a full-service smuggling package for Colombians, DEA officials say. “They have the language, proximity and a full network in New York, so they have no problems bringing money back,” one official said. Dominican officials from President Leonel Fernandez down have openly acknowledged that they are worried about the role their countrymen are playing in the drug trade and are seeking closer cooperation with U.S. law enforcement. Dominicans and Colombians check into entire blocks of hotel rooms for a week or more and sit by the pool talking on rented cellular phones until the shipment is set up, according to another DEA official. From there, the official said, the Dominicans take charge. Dominican “armies for hire” have taken over entire housing projects in Puerto Rico and in New York City’s Washington Heights neighborhood–staging areas to vastly expand Colombia’s U.S. drug market, DEA officials contend. Dominicans also control a two-block area in Queens that is full of wire-transfer businesses set up to launder money, said one DEA official. Colombians looking for new alliances in the drug trade have also targeted Puerto Rico, a U.S. territory that lies 70 miles east of the Dominican Republic. “Cocaine and heroin traffickers from Colombia have transformed Puerto Rico into the largest staging area in the Caribbean for smuggling Colombian cocaine and heroin [into] the U.S.,” James Milford, DEA deputy chief, said during testimony before a U.S. House subcommittee in July. When Jimenez’s agents cracked a major Puerto Rican drug ring in April, they arrested two Colombians and nine Dominicans. The alleged leader of the ring, Jouhan Rivera Rosa, had been arrested earlier in the Dominican Republic on separate drug charges. Traffic has also picked up over the past three years on the island of Aruba, a landing site for drug planes for nearly two decades, according to law enforcement sources. Proximity to Colombia–as well as connections to Europe and North America that the tourist trade has already established–has made Aruba an excellent transshipment point, U.S., Colombian and Caribbean authorities agree. In addition, Aruba is well equipped to provide money-laundering services, they said. Aruban smuggling fame dates to the days of the Dutch pirates. In this century, Arubans have established close contacts on the Guajira peninsula, Colombia’s traditional entry point for contraband. Still under the protection of the Netherlands, Aruba is now a major passageway for cocaine and heroin entering Europe, Dutch authorities say. The Colombians also appear to be turning to Central America for new drug routes into Europe. Guatemalan and German authorities are investigating a case that has so far resulted in the arrest of Andreas Haeneggi, the local general manager of the Swiss corporate giant Nestle, and his son. They, along with the police chief of the tourist resort of Antigua, are suspected of being part of a major drug ring that hid $100 million worth of cocaine in cut flowers bound for Germany. All three have denied the charges. With the operations of Italian allies curtailed, the Colombians are finding that their most reliable drug partner in Europe is the Russian mafia, officials say. With an explosion of drug consumption, especially heroin, in the former Soviet Union, criminal organizations–made up in part of ex-members of the KGB and former military and police officials–are making a bid for control of the East European market, according to Colombian authorities. “The Russian mafia has set itself up on the Caribbean islands so as to be able to contact the Colombians,” said Gen. Rosso Jose Serrano, commander of the Colombian police. For example, more than two dozen Russian banks have offices on the island of Antigua, raising questions about why so many faraway financial institutions would have so much interest in such a small island, Caribbean law enforcement sources say. Darling reported from Bogota, Puerto Rico, Miami, Barbados and Guatemala. Times Caribbean Bureau Chief Mark Fineman contributed to this report from Miami and Washington, and Special Correspondent Steven Ambrus contributed from Bogota. US president Barack Obama has been voted news maker of the year by 45% of Dutch primary school children, reports Dutch world service radio RNW, without quoting sources. In second place, with 22% of the vote, was Joran van der Sloot who is suspected of killing US teenager Natalee Holloway. Previous winners include crime boss Willem Holleeder, the controversial former integration minister Rita Verdonk and Mohammed Bouyeri, the man who murdered film-maker Theo van Gogh. What is so fascinating about the waters off of Aruba and the possible results of deep-sea mapping and gridding? In this forum, we are concerned with truth and justice for Natalee and her family. In other arenas, other spheres of interest, oil and natural gas and political cold wars come into play. Following the last very bad developments justice field in Aruba can anyone with only a little sense and a intelligence level of basic school, the conclusion that JUDICIAL the device known When it comes to actually his hole is. It is also proved that after most recent visit PG Brewers on Aruba, 3 a 4 suddenly the senior field had to overcome while OM kamt with a huge staff shortages; Ra Ra Ra how could that be? You have to let you use or abuse many Arubans note this and not to grieve Your sudden departure sir Mosje. Aruba is now a Iraq what little justice enforcement , and especially after the very bad case of not just one where the people in the generally very clearly faced with the policy of the OM not equal monks with unequal logging. To not even talk about the Natalee Holloway case. In the early 90 we also had the same situation He was known as that person not just someone, self Minister of Justice and his right PG Jan Zwinkels which was also also urgently needed in all leave after a disastrous policy implications of this. Hirsh Ballin, Brinkman, Ank Bijleveld Balkenende and screaming miles distant from the cold Aruba to small and accomplices for all those blunders still every day in Aruba take place, I think the boosdoenaar a great name and that is: the Netherlands motherland. Interfere in Suriname and Iraq and god knows what else is your primary task and responsibility, while this sort should be made and prosperity. Everyone goes back to Netherlands and now the guests of OM? When those extradited to America for all the blunders they caused and now with the levant leave. days for nothing in the tank chairs. Brinkman you and your Dutch drivers screaming hard and do nothing? We can but we also prefer to see a healthy policy effective results. One thing I must do the same give Mr. Brinkman and that is, Jorg himself to given that a lot is Aruba and now shows that it is as always, and perhaps become worse after the departure of Jorg. interesting views, sums the current crisis up nicely - also in historic perspective (PG Zwinkels is mentioned). Re: Hans Mos is Leaving .. THIS IS A LOOSE TRANSLATION!!!! Justice department is down hill. Because of the recent dubious judicial developments on Aruba, anyone with a bit of a brain & some intelligence can make the conclusion that the judicial system, known as the OM is down hill. 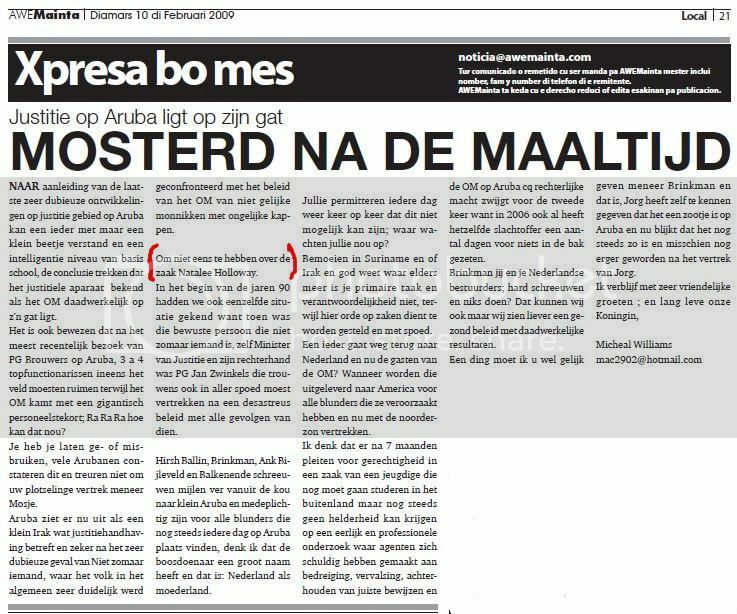 It is also been proven that after the recent visit of PG Brouwers on Aruba, 3 a 4 top ranking officials suddenly had to leave while the OM has an enormous shortage of staff. My, my…how can this happen? You have let yourself be used or abused, many Arubans noticed this & don’t feel sad because of your sudden departure mr. Mosje. Aruba looks like a small Iraq concerning the justice department & certainly after the dubious case of Not just anyone, where the people in general were confronted with the working policy of the OM of not treating everybody equally. Not to mention the case of Natalee Holloway. In the beginning of the nineties we had to deal with a similar situation because that person, who isn’t just anyone, was Minister of Justice at the time and his right hand was PG Jan Zwinkels; who had to leave suddenly after a disastrous working policy with all the consequences that come with that. Hirsh Ballin, Brinkman, Ank Bijleveld & Balkenende are screaming from far away to small Aruba and are contributors to all the failures that are still continuing on Aruba every day, I think the villain has a big name and that is: Netherland as metropolitan territory. You are saying time and again that this can’t happen; what are you waiting on? Meddle in Surinam and or Iraq and God knows where else isn’t your first task & responsibility, while things need to put in order here….and quickly! Some are leaving back to Holland…and now those guys from the OM? When will they be handed over to America for all the failures they have caused & are leaving now take a French leave? I think after 7 months of pleading for justice concerning a case of a youth who still has has to go to college abroad but still hasn’t been given the clearance to get an honest & professional investigation where police officers were guilty of threats, forgery, keeping evidence behind & the OM on Aruba cq the judicial powers are staying silent for the second time because in 2006 the same victim was in prison for nothing for a few days as well. Brinkman; you and your Dutch politicians; scream loud and do nothing? We can do that as well but we’d rather see healthy management with actual results. On one thing I do agree with you mr. Brinkman, Jorg has said himself that it’s a mess on Aruba and now it appears it still is; and it might even have gotten worse after Jorg left. Joran van der Sloot wins 13.800 dollar or 10.609 euro in Poker tournament. but he struck a deal so likely he won even more. The Party Poker $ 300K Guaranteed, a large online poker tournament, Sunday has a very well-known participant visited. The name AANOTILTKK you or say nothing, according to various poker sites is Joran Van der Sloot behind the screen name. Joran Van der Sloot is suspected of involvement in the death of Natalee Holloway. While online poker tournament ended Van der Sloot in a creditable fifth place (out of 1461 players), which was officially about 13,800 dollars or 10,609 euros. But even as the finalists for the elimination of Van der Sloot had already closed a deal, the Dutch are more likely to have taken over. Van der Sloot is almost daily since January found at Party Poker, one of the largest poker providers on the Internet. Party Poker $ 300K Guaranteed is the most expensive poker tournament where Van der Sloot to participate this year. The Dutchman took already part in tournaments like the $ 50K Guaranteed Saturday (320 dollars or 246 euro registration fee), the Million Monthly (460 dollars or 354 euro registration fee) and the High Roller $ 50K GTD (530 dollars or 407 euro registration fee). The Dutch parliament is not satisfied with the explanation State Secretary for Kingdom Relations Ank Bijleveld gave about leaked out confidential information of the Dutch representation on Aruba. The majority of the political parties agree with the criticism of VVD'er Johan Remkes, who called the letter on Tuesday 'very dissatisfactorily'. SP-member of parliament Ronald van Raak qualified the explanation of Bijleveld even as 'very bad'. The chamber wants that the State Secretary in a new letter creates more clarity. The parties want to receive the additional explanation before the beginning of March when they debate Bijleveld about the the leaked information, in which harsh words are directed at Arubans politicians. The PVV did Tuesday an unfruitful attempt to keep an emergency debate concerning the matter. "Finally we've got this this mafia government on Aruba by the throat and still the parliament doesn't want to talk about it'', spoke Member of Parliament Hero Brinkman disappointed. The State Secretary has written the parliament that she will let investigate the leaking out the information on Aruba. She cannot anticipate the outcome of it, but already has taken some measures to prevent possible recurrence. Bijleveld states in the letter once again that she finds the matter 'exceptionally serious'. Last week she called the Aruban prime-minister Nelson Oduber twice to iron out the differences. Oduber will come in March to the Netherlands. "Then we will discuss obviously the relation between our two countries'', said Bijleveld. ROTTERDAM - The final table of a large online poker tournament, the Party Poker $ 300K Guaranteed, appeared Sunday a very illustrious pokerplayer : AANOTILTKK. According to various poker sites Joran van der Sloot hiding behind this screen name. Van der Sloot, suspected of involvement in the death of Natalee Holloway, ended the tournament, with 1461 players participated in a creditable fifth place. This performance was officially good for $ 13,800 in prizes. Even for the elimination of Van der Sloot, the finalists already have a deal closed, so it's likely the more notorious Dutchman held on to the poker tournament. Van der Sloot plays almost daily since January on Party Poker, one of the largest providers of internet poker. The tournament last Sunday, Party Poker $ 300K Guaranteed, is not the 'most expensive' poker tournament that Joran van der Sloot played this year. Van der Sloot was also in the $ 50K Guaranteed Saturday (fee $ 320), the Million Monthly (fee $ 640) and the High Roller $ 50K GTD (fee $ 530). It is not known whether Van der Sloot directly or registering for this tournament that he won tickets through other cheaper poker tournaments. WASHINGTON, D.C. — The Department of Justice announced today that it will require Cal Dive International Inc. to divest certain diving assets in order to proceed with its acquisition of assets from Stolt Offshore Inc. and S&H Diving LLC. The Department said that the transaction, as originally proposed, would have resulted in increased prices and diminished services for saturation diving services in the United States Gulf of Mexico. Interesting article to say the least..Maybe Kermit,and or Island Monkey can shed some light as to why the DOJ would make them do this??? Norwegian contractor Stolt Offshore is set to sell its North American and Mexican inspection, maintenance and repair operations to US player Cal Dive for $125 million, it said today. The sale, which includes related assets, would enable Stolt Offshore to focus on its core business, the company said. The cash sale is subject to regulatory approval and includes seven ships that work in the inspection, maintenance and repair segment. Stolt Offshore will charter back two of those vessels from Houston-based Cal Dive to complete a Trinidad pipeline project in 2005. Is there a picture emerging or am i confused? Joran van der Sloot is addicted to poker, reports the Algemeen Dagblad. According to Patrick van der Eem, the undercover business that the 20-year unmasked, Joran on Titan plays under the name Joran888. His logo is a blond girl like Natalee Holloway. The Algemeen Dagblad reported that Joran the past two years intensively gepokerd on the Internet. In 2007 he was online to more than 200 tournaments, sometimes several times a day. Joran can play reasonably well and is good with regular tournaments, but his online hobby costs more money than it brings. This is evident from the statistics officialpokerrankings.com, which results from online poker tournaments can be obtained. AD.nl looked at the results of the 20-year-old from Arnhem joran_sloot, under what name the parties he plays. Joran van der Sloot show Party Poker noon poker tournaments to play. It is that of a very different game levels. On October 8 and December 3, he played tournaments with a registration fee of $ 215 and October 17, 2006 a tournament for only $ 2. The higher the fee, the better players in general poker. Van der Sloot was mainly the most popular variant of poker, No Limit Texas Hold'em. Joran has never won a tournament, but finished three times in the money. " The best performance he delivered in the $ 200K Guaranteed Sunday tournament on December 3. This tournament was 1024 people. The 39th place of Joran earned him a prize of $ 862 on. His total prize money on Party Poker is $ 1266. Because Joran van der Sloot more than $ 1266 fee he paid to a negative return of 20%. At the end of 2006 got Joran to Party Poker Full Tilt Poker. He played two expensive tournaments and lost within two days $ 379. Van der Sloot switches to the largest provider of Internet poker: Poker Stars. 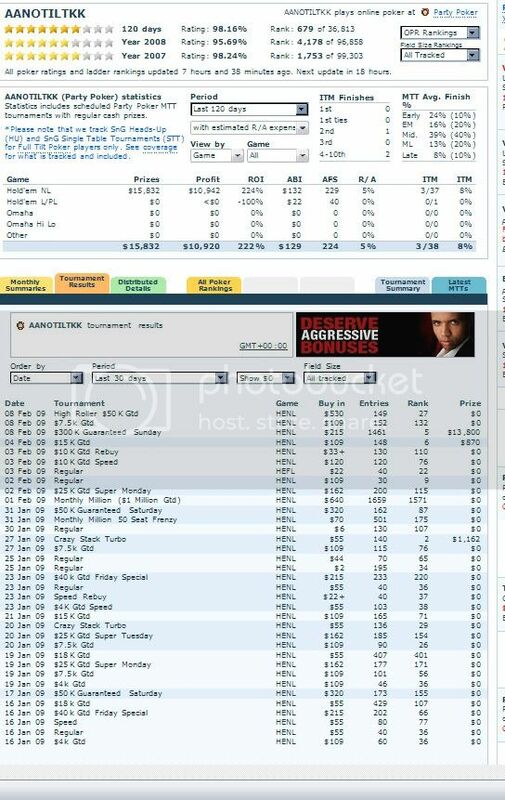 Here it seems an online poker addict to be until May, he plays daily poker tournaments. In total no less than 233! Two small toernooitjes he won in total twenty-five time he finished in the money. " The total prize money of Van der Sloot on Poker Stars is $ 1101. But here he paid much more fee with a negative return of no less than 74% as a result. On various websites that the names pokerpro68of, AANOTILTKK, angryshark68 and Joran9 by Joran van der Sloot used. Only AANOTILTKK wins more than he spends. From the above it can be deduced that Joran van der Sloot is a big fan of poker. He seems addicted to the game. Poker on the Internet cost him much money. His results are poor. Joran van der Sloot will know something of poker strategy - he is finished with a high number of tournaments - but really, he has never in the theory of poker deepened. It is a losing player. Peter R. de Vries said that Joran van der Sloot played sometimes amounts to "a normal person for a month to work." The program Pauw and Witteman reported that Joran Van der Eem 'crazy money'. 'It is only with him but how he himself can be better. " He said the man suspected of the disappearance of Natalee Holloway also a psychopath. " "This boy has no manners." Until the day of the unveiling was Joran Patrick harass with mail and SMS. Patrick had 126, which focused on poker. Horizon Offshore, Inc., headquartered in Houston, Texas, provides marine construction services for the offshore oil and gas and energy industries. The Company's fleet of nine vessels is used to perform a wide range of marine construction services, including installation and repair of marine pipelines to transport oil and gas and other subsea production systems, and the installation and abandonment of production platforms, in the Gulf of Mexico, Latin America, Southeast Asia/Mediterranean, and West Africa. I know it's not easy being green and it seems you are better at it than I am. I was looking for the Rick Bucher pic and couldn't find it...you did. thank you. Just found that he was speaking on behalf of CalDive in 2007. Hello?? Let me know what you find out.Seems CalDive is buying everything up! state secretary for Kingdom relation Bijleveld writes this in a letter to the Dutch parliament. i haven't found this letter yet, but i presume it is in response to questions by Brinkman after Rudy Croes came with the comments about Jan van der Straten in december 2008. But on the anti-trust issue, attached is the story and their settlement of it Sorry, the story is in 3 pages, that;s just how Bloomberg works, no way to upload them into one document-but I'll try to myself. Page created in 2.451 seconds with 19 queries.